Climate change is often discussed as something that will affect our future generations. Unfortunately, it is already having a significant impact on our world. A higher concentration of greenhouse gases in the atmosphere is affecting our climate, causing more extreme weather such as flooding, droughts, wildfires and heat waves. The map above highlights the impact climate change is having by showing the deaths in each country from these extreme climate events. The map, by The Eco Experts, uses data from the Global Climate Risk Index 2016 which aims to “contextualize ongoing climate policy debates — especially the international climate talks — with real world impacts of the last year and the last 20 years." Countries need to be fully aware of this data in order to make sufficient plans for an increasingly volatile climate. 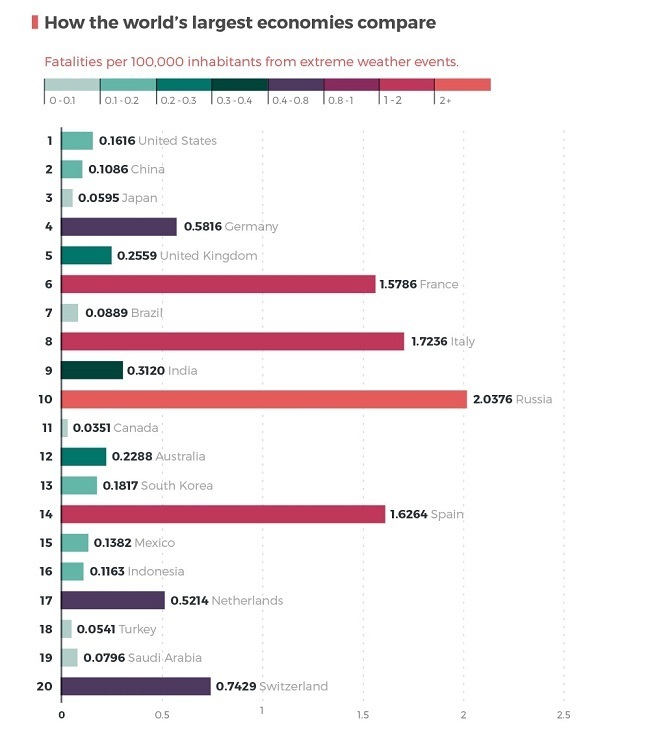 The chart above shows the countries with the highest death rates per 100,000 inhabitants from extreme weather events. Myanmar has the highest death rate. A staggering 14.7464 inhabitants per 100,000 have died from extreme weather events per year on average over the last 20 years. Myanmar has been hit hard by extreme climate events in recent years. Cyclone Nargis in 2008, for example, took the lives of an estimated 140,000 people. The chart shows Russia, Italy, France, Spain, Portugal, Belgium and Croatia are all in the worst 20 countries. This contradicts previous studies that suggest more developed nations will be less affected by climate change (see the map for this study here). Myanmar also tops the list for the most overall fatalities, shown in the chart above. India is second on this list. In 2013 India was hit by Cyclone Phailin, the second largest cyclone to ever strike the country. Russia also features in the top three worst countries for overall fatalities. An example of the increasingly extreme climate events it faces is the intense heat-waves of 2010 which saw 50,000 people die. The chart above shows the 20 best countries for death rate with recorded deaths from extreme climate events. Singapore tops this list with just 0.0022 fatalities per 100,000 inhabitants a year on average over the last 20 years. Nordic countries feature heavily in the best 20 countries with Finland, Sweden, Denmark and Norway all included. When looking at the world’s largest 20 economies according to the International Monetary Fund, it is clear that even many of these wealthy nations are struggling to deal with extreme climate events. France, Italy, Russia and Spain have alarmingly high death rates from extreme weather events. Jon Whiting is blogger for The Eco Experts, a renewable energy comparison website in the UK. Jon is passionate about the environment and creates visuals to help make environmental and climate change research easier to understand.